It’s a town synonymous with modern mansions, glittering sand, and crashing waves. We’ve seen it featured in movies and magazines as the quintessential Pacific Coast beach address. And like much of SoCal, such real estate comes with a price tag far too high for most of us to consider picking up and moving to this luxury location. But with Airbnb, we can at least vacation there and pretend to live the lux life. It’s still a budget-buster, but wouldn’t it be worth it to wake up to the sound of crashing waves on Zuma Beach? To be social in SoCal? After all, you could wind up rubbing elbows with Hollywood’s biggest names, and proudly invite them over to your oceanside abode for hors d’oeuvre. Ok, sure, maybe we’re just dreaming. But it stands that there are places you can take up short-term residence in Malibu for the right price. Take a look at what a few thousand per night could buy you in this city by the sea. Ready for a taste of Malibu’s most luxurious properties? See our 10 favorite oceanfront Airbnbs in Malibu. This Cape Cod is far from out of place on its 80-foot beachfront location. The easy breezy interiors are light and whimsical, modernized with wood plank beams and crown molding throughout the 6,000 square foot home. There are two master suites in this six-bedroom pad, as well as a detached two story guest house, which sleeps an additional five people in the cozy upstairs loft. This home is certainly a chef’s delight. With three ovens, two dishwashers and professional grade Viking appliances, it’s equipped for full catering (which you’d need if you’re feeding this entire home). The comfort of Tuscany and the views of Malibu — does it get better than this? Perched on the cliffs over the famous Zuma beach, this 11,000 square foot home offers unbelievable vistas of the Pacific coastline for you and 14 of your closest friends. The inside of the home is decorated to reflect the home’s Italian roots. The warm white color palette allows natural wood beams to steal the show — that and the expansive windows opening up to the outdoor space and beyond. But with all of the al fresco dining space and full outdoor kitchen (complete with a pizza oven), there’s hardly a reason to go inside at all. Nor to the beach — this home’s natural looking pool has built-in sun loungers and a spa for a tranquil retreat away from the sand. Glass houses sometimes get a bad rap, but there’s no reason to throw stones in this oceanside getaway. Sitting on Las Flores beach, this home has been newly renovated into a modern, yet comfortable, place to enjoy the ocean. The home provides amenities like an outdoor shower, paddleboards, and surfboards for beach-goers. For those staying on shore, the Glass House effortlessly opens up to the sand and allows guests to make the beach their own backyard while grilling and relaxing from the well-designed living room and deck spaces. And speaking of well designed — this main staircase is incredible, isn’t it? A stay at this iconic home would be a dream come true for architecture enthusiasts. Designed by Harry Gesner, this home can’t be missed along the Pacific coastline or driving on the 101. This architectural wonder has no two rooms that are alike, with acutely angled corners and unique windows to frame both ocean and mountain views. Stunning beam work creates the wing-like of this home that looks as though it’s about to take flight. 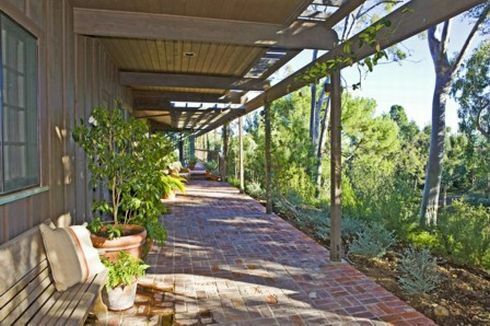 With three bedrooms, the home comfortably accommodates eight in its secluded location between Malibu and Santa Monica. Another renovated Cape Cod makes it onto our list with a truly beachfront location. Ceilings soar to 20 feet, French doors open up to the waterfront and elegant decor tastefully tops it all off. The social space in this home is impressive, with the gourmet kitchen as a primary space for the entire party to gather, cook, share meals and take in the views. This home comfortably sleeps a dozen in the seven bedrooms — the master with its own patio and outdoor fireplace. Like a castle perched on a hillside, this stone fortress overlooks the sweeping coastline in impressive fashion. The decor is masculine and defined without being dark and heavy, due in part to the Western facade opening up to view the ocean off the cliffside. Up the eye-catching spiral staircase, the home’s rectangular architecture means an expansive rooftop deck. The ambient lighting, stone fireplace, and state-of-the-art stereo system will have you up there long after sunset. However, the main patio and poolside aren’t bad choices for socializing, either. A big, beautiful beach house isn’t quite as fun when you’re crammed in next to the neighbors. That certainly isn’t the case in this Airbnb. Situated on seven private acres, this home is owned by an international rockstar (we’d love to know who!) and being rented to benefit the Bridges of Harmony Foundation — an organization that advocates for the healing powers of arts. Up to 16 guests can enjoy this traditional home overlooking the coast, with a pool and plenty of indoor and outdoor entertaining space. The magic of Malibu and the beauty of Bali come together in this spa-like estate on the coast. Spread out over 7,000 square feet, the Balinese-style home features jaw-dropping wood cathedral ceilings, a modern and massive chef’s kitchen, and spacious double master suites. Unobstructed views of the ocean can be found anywhere in the home, or from the infinity pool in the open backyard. Guests who have stayed in this ocean level home describe it as “scenic” and “cozy”, and we would agree with that and so much more. This home puts guests right in the sand and surf, making it easy to grab lunch off the grill in between surf sessions on the private beach. The interiors channel modern nautical style that mean bright whites and comfortable, chic furnishings. Don’t miss the cabin-style bunk bed. The home sleeps five guests, and we can bet every one of them will be hanging out on the deck at the tiki bar or in lounge chairs with the sand between their toes. A recent renovation, this home close to the heart of Malibu’s best shopping and restaurants has 75 feet of beach frontage. That not only means huge views and entertaining options in the backyard but also that every room in this home has an ocean view. The interior is fresh, simple, and perfectly furnished to compliment the blue views. We love the vaulted ceilings and wide plank flooring throughout the three bedroom home. And when you want to step down to the beach, it’s only six steps down until your toes touch the sand.